The sad truth is, I don't have much of a system. Rather, I don't have any sort of system that I can articulate. It's like how I shelve my books or stack items on my desk at work - there is a plan, there is a reason for everything, but not that anyone who isn't me would discern. This doesn't always serve me well; sometimes I end up with things like Haan Maine Bhi Pyaar Kiya. I used to research movies a little bit, but now I just take things as they come, usually something I've encoutered while reading (Kandoukondain Kandoukondain). Sometimes it's the picture on the box, I'll be honest - that's how I got my much-beloved Mujhse Dosti Karoge!, for example. Some things I feel I should watch in order to be a better-rounded, more informed Bollywood fan who has her own opinion on the legends (Sholay, Mughal-E-Azaam, and, believe it or not, Jaani Dushman - no one said legends have to be good). 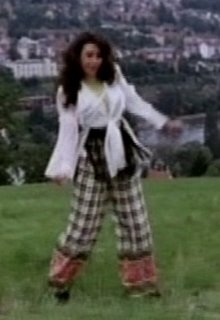 Sometimes I've seen a clip and want more where that came from, whether delightful (Gumnaam) or horrifying (Disco Dancer). A star can help a movie I'm otherwise uncertain about or ignorant of make the cut (Hrithik and Preity made me try Lakshya) or stay on the shelf (Govinda has stopped me from more than I can remember). And of course, sometimes things have to be seen to be believed (Chori Chori Chupke Chupke). My favorite method, though, is personal recommendation (Swades). No matter the outcome of the viewing, it's so lovely to have someone think about you and what they think you might like or about wanting to share something with you. 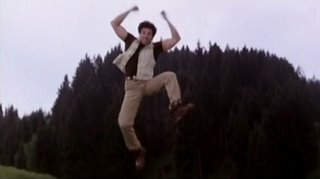 All of which leads us to Jeet, which I watched solely because I heard it had a wildly funny dance sequence in it. 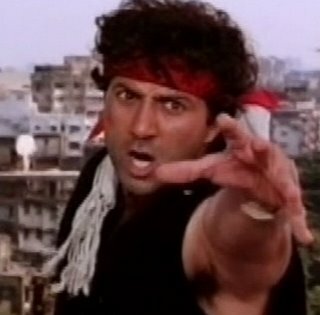 Behold, the Stomping of Sunny Deol! The song is "Yaara O Yaara" and you can see the whole thing - if you dare - here. 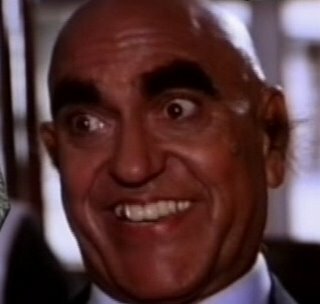 and, saving the best for last, Amrish Puri with fake eyebrows and teeth - and ear hair? To be honest, Jeet's plot is not my cup of tea, especially the whole notion of "hey girls, let's fall in love with the man who is a known criminal and is so violent and rage-driven that he breaks into your house and beats up your father!" - nor are the extended action sequences that challenge most of the laws of nature. And some people will want to be warned that this movie features Johnny Lever in drag. But who cares? The dance, oh the dance! Sometimes that's all you need. DO NOT I repeat DO NOT see LOC Kargil!! You watch a lot of crap movies. Why would anyone in their right minds watch a movie like Jeet ? If I may put it bluntly, I sometimes think that you watch movies just for the sake of watching..and then writing about it on the blog. There are hundreds of "good" bollywood movies that one can watch (though they may not be availbe in Chambana). You can try Netflix...or even better "Nehaflix.com". Annous - understood. That's kinda what I had been led to believe, although I might have to watch it someday just to understand outrage like yours :) - a philosophy that in the past has made me start stunningly bad films like The Avengers. bb - yeah! It's hard not to turn a post about a movie like this into Go Fug Yourself. I need to start keeping track of costume designers. uiuc_anon - ouch. That hurts, I have to admit (if I understand you correctly, that is). The recent spate of bad movies (Asambhav, Jaani Dushman, Kismat, and Dhund: The Fog - which I agree were really bad, although some of them were still fun - were brought to me by a houseguest who is himself a huge fan of Bollywood, and these are films he enjoys specifically because they are bad, and I wanted to see if I could identify with his love. I couldn't really. But mostly I watch things because I want to know what I'm talking about. 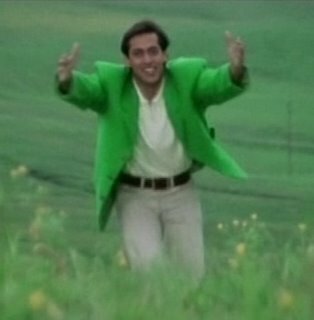 I still feel so new to Hindi cinema that I can't consistently make a sufficiently informed opinion about something without seeing it. This is not a problem I have with American films, whether Hollywood or otherwise; usually from a review or two, or just knowing the plot or main actors, I can decide whether I think I'll get anything out of seeing it. It may seem like there are Hindi films I watch because I don't know any better, and I do so because I want to know better, and the only way I can do that soundly is by watching. What stings a little bit in your comment is the idea that I go fishing around for things just to write about them. I don't. The writing is something I do because I enjoy it. It may be a challenge with certain movies, but I love a writing challenge (and having them at work is one of the things I love most about my job). And if there are movies about which I only make superficial comments, it's because I'm uncertain enough of moviemaking that I don't feel I can say anything more substantial intelligently. As for movies to watch, I am grateful for any suggestions people want to give me. As for Netflix, I'm sticking to Rentertainment and Annapoorna for as long as I can because I feel strongly about supporting my local businesses, even if I'm missing out. I would love for you to suggest movies to me. PS I hope I haven't over-thought what you're saying, and I don't mean to be sensitive. It was a rough night last night, and I'm really sleepy, and it's quite possible my brain isn't really fully in gear. that was a bit of a salty comment uiuc_anon. I'm with you Beth. As for Hollywood, we've all spent a few dreary Saturdays holed up in the house with nothing but random flicks on tv when we were growing up. Inadvertently, we've been able to discover our tastes in Hollywood, a sense of high/low quality aesthetics, etc. The only way to get that same feel for Bollywood is to slug through it. Same game. Different players. You know that thing that happens when you're ingesting a liquid beverage and encounter something SO funny that you HAVE to laugh but just end up squirting said beverage out of your nostrils? And no Beth, I don't blog. I don't think I can handle the criticism as gracefully as you do (to uiuc_anon - grrr! those who can't write, comment illogically). I broke my first rule of "commenting". Don't comment if you are angry at something...and just to be clear, that 'something' wasn't your blog or your choice of movies. It was my discussion with a fellow colleague at the university. He had watched some "Indian" movies and was making blanket statements about the foolishness potrayed in those movies, and about the ground stiuation in India. His limited knowledge (and abundant ignorance) put me off. Sorry for being so blunt in my previous comment. I can understand your philosophy now. To get a real feel for Indian movies, one has to watch both the good and the bad (and sometines even ugly). Being a desi, I'm quite used to it..and have a knack of identufying bad movies (by looking at the trailer, cast, director ....ot just the poster fo the movie). Smae is true with hollywood movies too....sometimes knowing the title is more than euff to put you off (like 'snakes on the plane'). uiuc_anon - I'm glad you posted the second comment in a more cool frame of mind. I guess your friend has not watched Hong Kong style movies or is a typical guy who worships violence over song and dance. Movie critics also have to watch every single movie that comes out - good or bad. They don't seek out movies to slam. Have you listened to the Mungles on Movies podcast? The husband and wife do not agree on the same movie. Very few movies - Hollywood or Bollywood are really "paisa vasool" for a full price movie ticket. I second the "stay away from LOC Kargil" comment from annous. It's a terrible, boring movie that should be prescribed for insomniacs. Even if it does have Akshaye and Abhishek Bachchan, it's just not worth it! 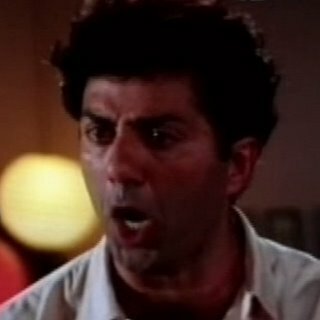 Ohmygod, he looks EXACTLY like Kramer in that screencap! And the stomping is priceless, I have to find this on YouTube so I can watch the whole song. Amrish looks like one of the Muppets in that last picture. And I'm bizarrely interested in Johnny Lever in drag. Yikes. Re. the watching good/bad movies debate. I have a list of must-see movies I'm trying to follow, so I've mostly only seen good stuff for now (or at least nothing TOO awful), but lately I've actually been wondering whether I shouldn't watch some films from the avoidyaar category too, just so my view is not too one-sided (if that's a word). pinke_v - that is one of the very nicest things anyone has ever said to me! I feel the same way about bollyhoo.blogspot.com, whom you must read if you haven't already. And I am pretty clearly going to have to hunt down exmaples of the other moves you mention. uiuc_anon - thank you thank you for the follow-up. That makes total sense to me. I can very much understand your frustration with your colleague - and if you need me to help you convince him otherwise (if it's worth the battle, that is! ), I am so there. I think you're so right about growing up with a certain set of cultural...what's the right word...products? works? whatever, you know what I mean - I, for example, refuse to watch Keanu Reeves or Patrick Swayze movies no matter how delightfully, even importantly, bad they might be, because I just know it won't be worth it. So I will never fully understand the awesome badness that is Roadhouse, or the blockbuster silliness that is Speed, but that's just fine by me. One of my much-trusted movie advisors in India just told me he's going to see Snakes on a Plane, and a few weeks ago he said he enjoyed the Miami Vice movie - yet he has seen only one episode of the Simpsons, no matter how much effort I spend describing its epic greatness and cultural heft. Sigh. I don't know how I can be so fond of a person who doesn't understand all that is Milhouse, but so be it. Emily - duly noted! I'm glad to be hearing concrete thigns about this movie, even if it means I won't get to see my FPMBF. Maja - yes, quite Muppety! I understand about the Johnny thing. You'll encounter it sooner or later - I'm sure someone here could easily tell you how many films he appears in drag in (and I can think of two in addition to this one). And yes, watch some bad stuff. Then you'll have a more refined, more finely-honed sense of why good is good. Or at least a more contextualized one. And I've found that there's almost always something to enjoy in them. beth: if i can contribute to the movie-picking algorithm - just don't watch anything with Sunny Deol - or even Bobby Deol - in it. Sharon - Sunny Deol had one or two watchable movies. Damini was one - he plays an alcoholic lawyer. The theme is serious. People say Gadar is also good. I quite like Bobby Deol, actually--he's good in Bichhoo and Humraaz. He has a tendency to stare blankly at the heroine and look dimwitted, which ruins otherwise romantic movies, but I think he's rather cute, so I like watching him. The cheesiness, oh the cheesiness! Sometimes that's all you need. Thanks Beth, that does make a whole lot of sense to me. PS: Have u seen Akshaye's Mohabbat? ?